Happy New Year from Just Mosaics! Not quite the New Year, but I feel brimming over with excitement for plans and mosaic commissions and possibilities. It's a great chance for me to discover all sorts of artists and to share their work on a regular basis on my page. I would really appreciate if you all would spread the word, and encourage artists to contact me via my Facebook page. All art media from anywhere in the world are welcome - whether you sell your art or just dabble - I would need a few images and some contact details, and who knows ... ?! - the miracle of the world wide web! If it's something you are interested in, please get in touch - a bit of free exposure is always welcome! I know how hard it is for artists to get their work out there - whether people like it or not is up to them - the subjectivity of art! - but for it to be seen, is the first step! I cant do it without you, so let's make this something great for the start of 2013! After my false start (long story!) with Facebook, then having to set up my own page, I began to realise the potential of Facebook for connecting with other artists and interested people, sharing work, interacting, reaching a greater audience, and generally have a buzzing Facebook page- how exciting! One billion users! It hasn't quite worked out like that for me yet, and yes, I am impatient, but I love to connect with people and to be busy in my studio so, as I said before, forgive me. So, as I hope and look forward to a bit more Facebook action, I have tried to make my page an even more fun and interesting place to be! I have added apps all for FREE to enhance your visiting experience! 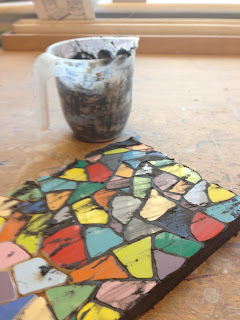 A spot of mosaic colour! It wasn't difficult - really - it did take a while, but I really quite enjoyed it. Maybe you would like to do something similar on your Facebook page? Here's a quick sharing of what I did, so you don't have to go through all I went through! I added my Pinterest and Twitter apps from www.woobox.com, and made my reviews app myself by using the html option and copying and pasting the reviews clients had kindly sent me. I set up my own little store app with www.bigcartel.com which allows payment to be taken by Paypal, which is reassuring. Finally, I created my own art gallery using www.artweb.com which was, once again, easy and fun to set up. All done! Please take a look at all my efforts and show me how friendly and outreaching Facebook can be! If I can help at all with you setting up apps on your page, with my limited experience, I would be delighted to! I have been thinking about making abstract mosaics like these for a while, and I've loved making them! I hope you think it has been worth the wait. It was a bit alarming when I started using such a dark grout, but am really pleased with the effect. I love their versatility - I can make any size, shape and colour combo for both inside and out. A mosaic spot of colour grouted..
Those gorgeous nuggets of colour just uplift the soul! The Just Mosaics social media strategy! This time last year my small original mosaic art business was promoted through my lovely website and word of mouth - I knew nothing about Twitter, Facebook, Pinterest, blog..! A year on, I am a little wiser and have a plan - my very own social media strategy! Allow me the catharsis of sharing it with you. Bear with..! Firstly, I can see how great and enjoyable social media is for getting work out there and for connecting with other people, and discovering and sharing work. But I found myself becoming too distracted by it all, feeding my desire to check the computer just once more before I got on in the studio...etc etc! Not good! And, having gone up a few false avenues (as you do! ), read some articles, spoken to friends, I am now much clearer about the place I want it to have in my business life and marketing. It has to be practical, effective and fun, but it is only a means to an end, and not an end in itself. So, there are four elements I use - Twitter, Facebook, Pinterest and this blog. I have taken the honest advice on board from people who follow and 'like' me, and understand that less can be more, but, at the same time, not forgetting that it is my business. Finally, I will write a blog every fortnight or so, about topics that I hope you will find interesting. I love to receive comments, and answer any mosaic questions (if I can) - so please keep them coming! Excuse this clarifying of my thoughts - I have been diverted from what I really love to do (making mosaics) over the past few months, and it time to make a plan about social media and stick to it!